What is a Smart Mirror?, What can it do for us? Some of you may know about new technologies and some others don’t, so I will begin describing in short on what is a Smart Mirror. 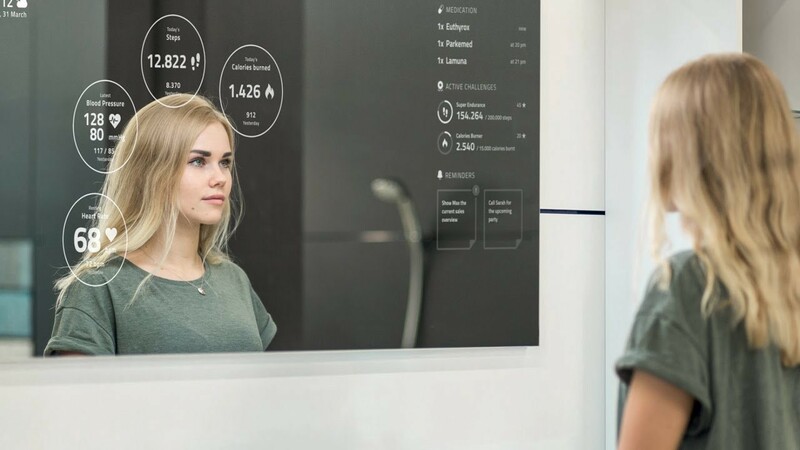 A Smart Mirror is like any other Mirror but it is manufactured with a lot of Hardware-Technology like temperature sensors, LED for illumination, LCD Display for information, internet connection, touch capabilities, and a brain that is an internet of things Operating System. Imagine waking up, going to your bathroom to get ready to conquer the day and you look into your mirror and you receive all the information you need to start your day, like weather information/forecast, emails, calendar, estimated traffic to your destination and endless possibilities. All of this without moving a finger, that’s the purpose of technology, to make our life easier and focus on what it’s really important. Besides our homes, Smart Mirrors can be used in various business like clothing shops, beauty shops, barber shops, kiosk mall, and many more. But it isn’t all about the interactive “kiosk” type, it’s more about the Artificial Intelligence it can bring to the world, telling you all the info you need depending on the place you are. Imagine going to your Beauty Shop to get a haircut, everything is normal, everything looks the same but they have smart mirrors installed instead of normal mirrors, now instead of waiting in your chair or look into old magazines you can browse a book of haircuts in the mirror in front of you, you can watch your favorite videos, read a book, watch movies or Tv series right in the mirror in front of you, all of this sitting in your chair and with a remote control. This is a game changer for most of the industries that have mirrors installed and is a crucial part in their business. I think we are all going to have a Smart Mirror in our homes soon or later, because the price of a normal mirror will be very close to a Smart Mirror, and why would you like to have a normal mirror if you can pay for a technological mirror. Mexican entrepreneur. Founder of the first Smart Mirror Startup in Mexico.